Increased Nacreous Clouds: A sign of colder upper air temperatures | Watts Up With That? Also known as “Mother of Pearl” clouds, nacreous clouds are peppered with tiny ice crystals that blaze with iridescent color when struck by light from the setting sun. It is these crystals that make nacreous clouds so rare: they require exceptionally low temperatures of minus 85 Celsius (-120 F) to form. Icy nacreous clouds float 9 to 16 miles high, curling and uncurling hypnotically as they are modulated by atmospheric gravity waves. 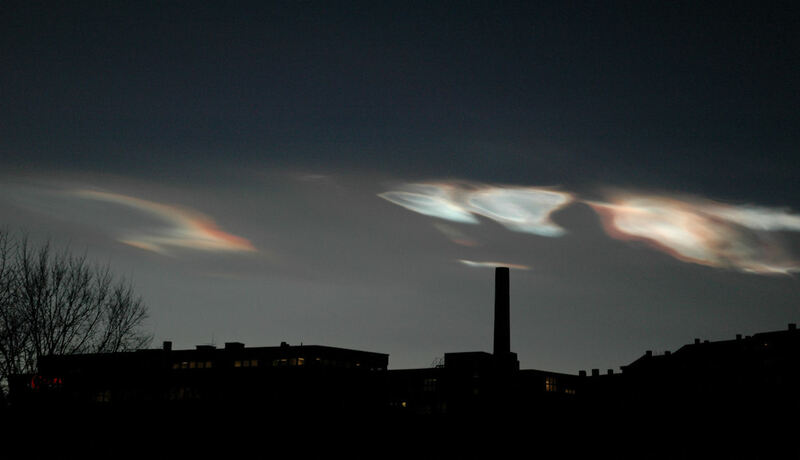 For much of January, these clouds rolled across the Arctic circle with puzzling regularity. Why the sudden abundance? Is the show over? No one knows. Stay tuned for February! 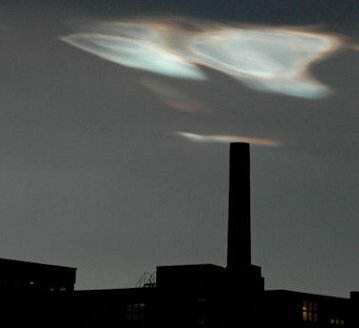 For more, see the 2008 Nacreous Cloud Gallery For the science behind nacreous clouds, please see this entry in Atmospheric Optics. As for temperatures at high latitudes, its -35°F in Saskatoon at the surface this morning, so there’s a chance we’ll see more nacreous clouds in days ahead. Too bad there isn’t a nacreous cloud index. It would be interesting to see if the these clouds are correlated with the onset of significant (long-term) changes in climate, especially for the Northern Hemisphere. One also wonders if there is any mention of them in Scandinavian folklore. Those are some cool (no pun intended) clouds! I’ll second that, Steve. Who in their right mind wants to go back to the winters we had in the midwest back in the 60’s, 70’s and early 80’s when night time low temperatures of -10 to -20 were not uncommon along with days at a time where the daytime high never got above single digits. No thanks. 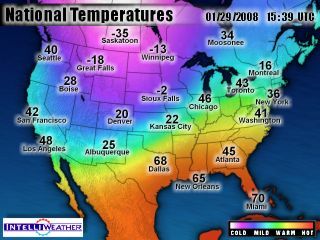 So does anyone have a guess as to where the month of Jan 2008 will be in terms of temperature? From all the press on snow and cold you would think it would be one of the coldest months in a long time. Sounds like the winters I spent in Illinois from Feb 2004 to 2005…. Doesn’t seem like things have changed. 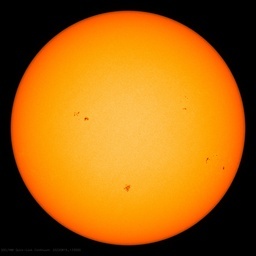 Well, this is a prediction, of sorts, from the AGW crowd. Stratospheric cooling. Of course ozone fits in the picture somehow. High level ice at a cold enough temp depletes ozone. REPLY: This recent post might be more on par with your thinking.